Checking patients’ mouths for signs of cancer is nothing new and, with the subject being a recommended CPD topic, arguably awareness among the profession has never been higher. However, how often do you actually talk to your patients about mouth cancer? Do they know that the checks you are carrying out are for signs of disease? And, do you tell them what to look out for and to come back if they spot anything unusual? Well, for one Scottish charity, the perfect starting point is simply talking. Talking to your patients, to your colleagues and everyone else in between. We started promoting mouth self-examination and trying to empower people to pick up any early signs in their mouths which might represent a mouth cancer. 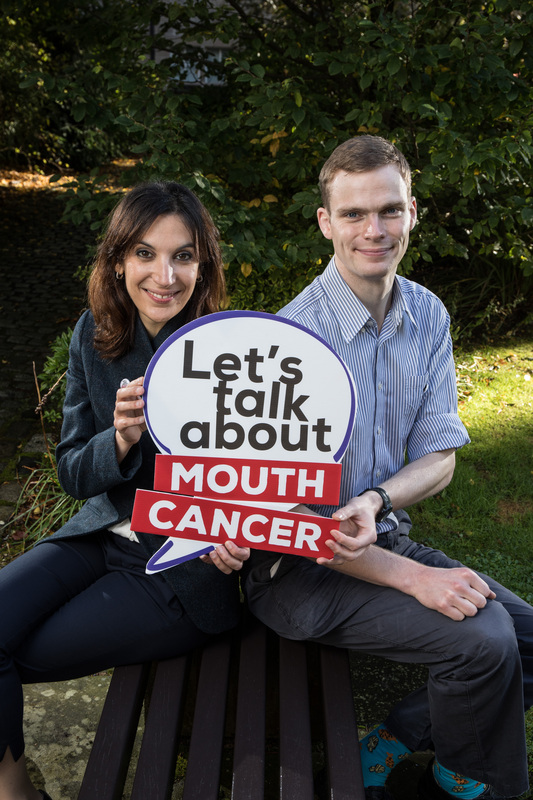 Let’s Talk About Mouth Cancer (LTAMC) started when two junior dental trainees at the Edinburgh Dental Institute (EDI), Niall McGoldrick, a Dundee graduate, and Orna Ni Choileain, from Cork, were paired together as clinical partners. 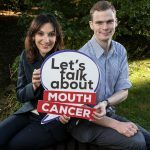 Niall had taken part in the annual Dundee Mouth Cancer Awareness Week, and Orna in Cork’s own annual awareness day, and they decided that they wanted to do something similar in Edinburgh. 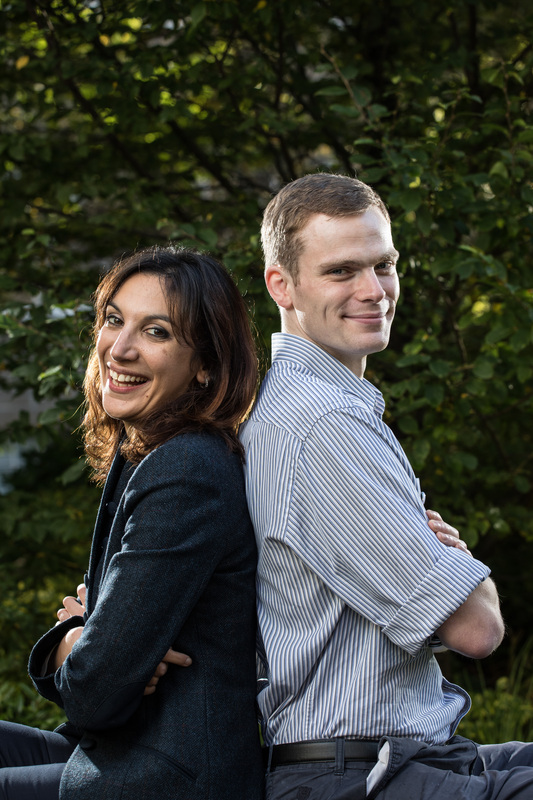 They asked Ewan MacKessack-Leitch, who was the senior house officer at the time, what he thought and he approached Professor Victor Lopes, head of the oral surgery department, and his registrar, Stephanie Sammut, for their input. They all decided it was a great idea and set about organising the group’s first awareness event. In February 2014, the group ran its first campaign in Edinburgh’s Bristo Square, with the help of a number of colleagues, including third and fourth year hygiene and therapy students and dental nurses from the EDI. They set up a marquee and, as well as speaking to the public and students about mouth cancer, they carried out a number of mouth cancer screenings. Stephanie said: “We saw and screened nearly 600 people. And, while we had them there in the chair, that was our opportunity to start to talk to them about mouth cancer, the risk factors and looking out for signs in their mouths. Ewan was coming to the end of his time in Edinburgh and, although Niall and Orna still had another year in the city, they needed to decide whether the event was a one-off or something that they wanted to continue and build upon. By that time, Ewan had moved back to Dundee to do his last SHO year and he spoke to colleagues with a view to incorporating their ideas into the annual Mouth Cancer Awareness Week campaign. It was decided at this point, for a number of reasons, that the LTAMC events needed to move away from public screening. Prof Lopes, the group’s policy advisor, is still at the EDI as a consultant maxillo-facial surgeon, while Ewan now works as a GDP in Glenrothes, with one day a week at Dundee Dental Hospital and School as a specialty dentist/honorary clinical teacher in paediatrics, as well as being the LTAMC treasurer. Stephanie, who now works as a consultant oral surgeon at Dundee, is the charity’s secretary. Niall holds the position of convenor and now works as a specialty registrar in dental public health with NHS Fife. Orna is the research lead for the charity and she moved back to Ireland to study medicine at Trinity College Dublin. Stephanie explained that the charity currently works on a number of different levels. She said: “Firstly, we work to raise awareness among the public about the disease and the risk factors, what the signs are and to encourage them to check their own mouths and attend their dentist if they find anything strange in their mouth. “The second element is working with students, the professionals of the future. Here in Dundee every year we run a mouth cancer awareness campaign with the final year students, we do a lot of teaching with them and really try and engage with them. In Edinburgh at the moment we have been able to engage with the hygiene therapy students. LTAMC also has an ongoing collaboration with Caring for Smiles, the joint NHS Scotland and Care Inspectorate oral health project. Stephanie said: “Earlier this year, we were approached by them and asked if we might be able to develop the idea of mouth self-examination for carers in homes, to check residents’ mouths for signs of mouth cancer. all about advocacy. He said: “It doesn’t matter how many fancy operations there are, the truth is that the five-year survival rate of patients with oral cancer has not changed over the last 50 or 60 years. Highly morbid, complex surgical procedures have never been subject to formal health economic analysis. Surely early diagnosis and treatment is the way forward with lower morbidity of patients and lower costs for healthcare systems. The group’s first foray into advocacy was around the campaign for HPV Action, trying to get gender neutral vaccination. They wrote a letter to Aileen Campbell, the public health minister and every single MSP in parliament explaining why they felt gender neutral vaccination was the right thing to do. As a result, MSP Bill Bowman lodged a motion on the group’s behalf extolling the benefits of gender neutral vaccination, which got support from across the chamber. They then got involved with a consultation by the Scottish Medicines Consortium. LTAMC argued that nivolumab should be provided on the NHS for late stage head and neck cancer. The drug, which was licensed in 2016, has since been made available on the NHS. As a result of this, the group has been invited to provide a drop-in session at the Holyrood parliament where Prof Lopes and some students and trainees from Dundee will talk to MSPs about their work. While, so far, mainly as a result of where the trustees have been based, the charity has focused on events in Edinburgh and Dundee, the group are keen to spread the message further afield. Plans are in place to hold CPD evenings and talks in Aberdeen and Glasgow in the near future and they are keen for any LDCs and local groups to get in touch if they are looking for lecturers. Stephanie explained that for their recent CPD event, they welcomed the husband of mouth cancer victim Jenny Rankin, who died after her cancer went unnoticed for too long. His powerful personal story illustrates what LTAMC is trying to prevent and the charity is eager to bring home the message in as many ways as possible. Jenny, who hadn’t been in contact with the charity before her death, asked for donations to LTAMC at her funeral to raise awareness, and her husband’s appearance at the CPD evening provided a moving and heartfelt aspect to the event. However, the trustees are keen to point out that there are many ways that dental professionals can get involved with the charity outside the awareness month. They will always welcome donations and, in the past, colleagues and friends have abseiled down the Dundee Dental School building, walked from Land’s End to John o’Groats and carried out 10,000 step challenges, all to raise money for LTAMC. 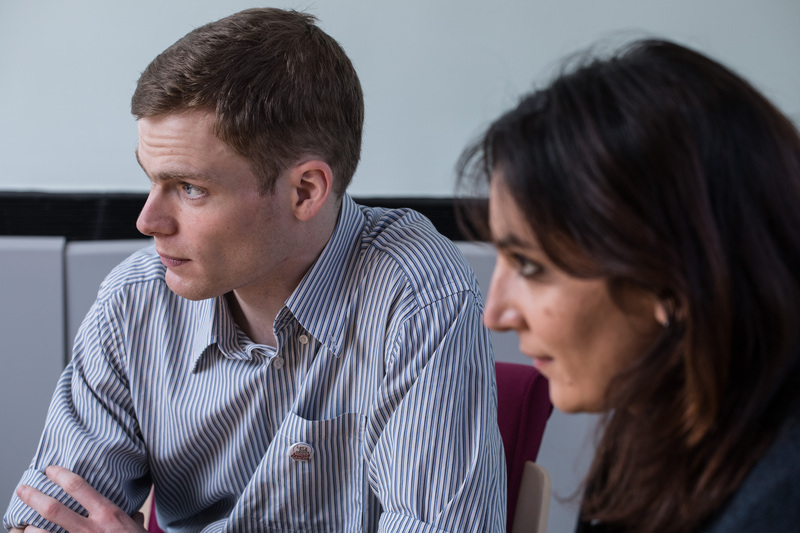 The trustees are all very keen to be involved in a second Global Oral Cancer Forum if and when it takes place, but Ewan explained that they are keen to be able to provide evidence that what they are doing is working. He said: “We want to try and see if there is some way that we can validate the approaches, so that if we get to another Global Oral Cancer Forum, we can come back and say that we listened, we took on board the advocacy work, ran the public campaigns and lobbied in parliament and this is working or that is working. While the trustees are aware that they need to start producing the evidence, the act of talking about the disease and risk factors is still absolutely central to their cause. Stephanie said: “That’s really what we are about – Let’s Talk About Mouth Cancer – let’s not make it a taboo. 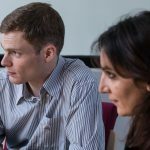 “But I think our work is also to empower and to give the confidence to these professionals that if they do pick something up, they have the courage and the confidence to say, ‘Look, I’m a bit worried about that lesion in your mouth, I think we need to send you up to the Dental Hospital’. It is about being able to do that because, a lot of the time, patients end up coming to see me here and they don’t really know why they are here.